The Gallipoli Six L – R Sgt Joe Meade, Airman Michael J. Whelan, Petty Officer Kevin Heade, Petty Officer Cormac De Barra, Sergeant Tracy Walsh, Coy Sergeant Jim Aherne. Cape Helles Memorial – 24th April 2015 (Photo by Sgt Tracy Walsh). 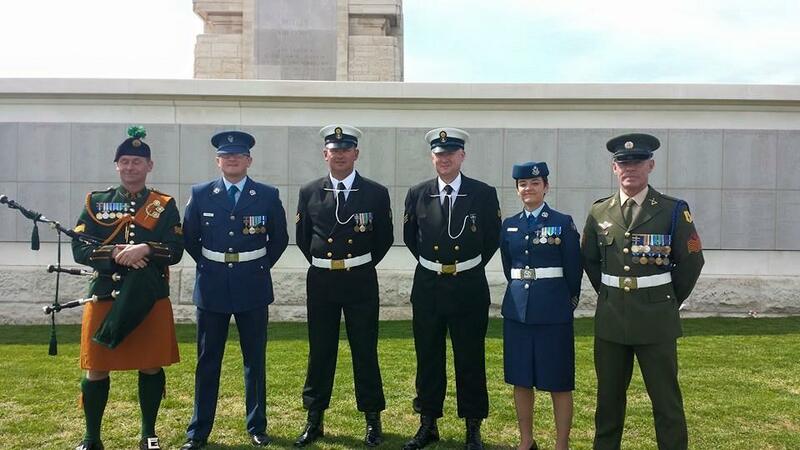 L – R Sgt Joe Meade, Airman Michael J. Whelan, Petty Officer Kevin Heade, Petty Officer Cormac De Barra, Sergeant Tracy Walsh, Coy Sergeant Jim Aherne. Cape Helles Memorial – 24th April 2015 (Photo by Sgt Tracy Walsh). Recently I had the honour of representing Ireland and the Irish Defence Forces at the Commonwealth and Ireland commemorations of the April 1915 landings on the Gallipoli Peninsula during the Great War. Many Irish soldiers serving in the British and ANZAC forces perished or were badly injured during the almost 9 months campaign and the Irish state has now officially recognised their part in the battles that took place in the Dardanelles one hundred years ago. I was selected by the General Officer Commanding the Irish Air Corps to be part of a team of six Irish Defence Forces personnel (two from each of the three services – Army, Navy & Air Corps with one of the army members being a piper and an Air Corps member being female) to take part in the commemorations on April 24th at the Cape Helles Memorial. The six Irish Defence Forces personnel were Company Sergeant Jim Aherne (7th Infantry Battalion), Sergeant Joe Meade (piper – 7th Infantry Battalion), Petty Officer Cormac De Barra (Irish Naval Service), Petty Officer Kevin Heade (Irish Naval Service), Sergeant Tracey Walsh (Number 3 Operations Wing, Irish Air Corps) and myself Airman Michael J. Whelan (Irish Air Corps Museum, No. 4 Support Wing, Irish Air Corps). A few long hard days were had by the six representatives in the preparations, travelling to Cape Helles and the many rehearsals with British naval and army forces. All six of the Irish Defence Forces representatives accompanied An Tuachtaran Na hEireann Michael D. Higgins – President of Ireland and Lt. General Conor O’ Boyle – Chief of Staff of the Irish Defence Forces on the flight to Istanbul on April 22nd and later we were all present at the Commonwealth and Ireland ceremony in Gallipoli on the 24th. His Excelleny General V.K. Singh (Ret), Minister of State for External Affairs, the Republic of India among them. Company Sergeant Jim Aherne (7th Infantry Battalion, Irish Defence Forces) read an excerpt from a letter written on the 13th of August 1915 to his father by Captain Paddy Tobin ‘D’ Company 7th Battalion, Royal Dublin Fusiliers. Captain Tobin was killed at Suvla Bay three days later aged 21 years. Sergeant Joe Meade (Piper – 7th Infantry Battalion, Irish Defence Forces) played with the Band of the Royal Regiment of Scotland and the Prince of Wales Division’s Band throughout the ceremony. Petty Officer Cormac De Barra (Irish Naval Service) delivered the wreath from the Irish People to the President of Ireland to be placed at the memorial Sergeant Tracey Walsh (Irish Air Corps) delivered the wreath to the representative from the Federal Republic of Germany to be placed at the memorial before returning to their positions in front of the monument and opposite the fifty-seven member Royal Navy Guard of Honour, where the military representatives of Canada, Australia, New Zealand, France and the Republic of Ireland lined the route. As a historian I have a keen interest in the First World War and the Irish soldier’s roles in it. I had visited the peninsula a few years prior and so it was real privilege and a humbling experience for me to be back near the beach cemetery again (V Beach) for this remembrance ceremony and to be part of the small delegation representing my country at this history making event, where almost to the exact moment 100 years ago Irish born soldiers serving in the British and ANZAC forces came ashore into decimating machine-gun fire. The thing I remember most about Gallipoli or what resonates with me the most I think is the fact that so many men on both sides died in such a short period in such a small area and most of them have no graves. The Gallipoli peninsula is their resting place and though it is a beautiful landscape the dead are still there in the energy of the place.